The grid-connectors are critical devices which transfer the accumulated green energy from wind and solar power systems into the main grid. The single-phase grid connection for PV and wind power systems is one of the key components of stable and efficient power transfer into the grid. Grid-synchronization, EMI problems, harmonic regulations and efficiency are design issues involved in the definition of a model. Detailed modeling of the grid synchronization and modulation techniques, as well as power electronics technology, are required in the modeling of grid converters for green energy. 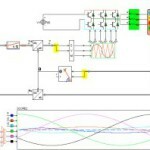 Quadrature controllers, analogous to field oriented control in electrical drives, allow the control of active and reactive power in both single and three phase grid connections. CASPOC empowers engineers to simulate important factors such as modulation strategies, loss determination and thermal cycling, as well as life time estimation.